Olivia went fishing and caught an octopus!! Will her mom let her keep it?!? Read the story of Olivia and Her Pet Octopus and then make your own Olivia rag doll and her cute under the sea pet! Download the instant access pattern, cut out the pattern pieces and follow the instructions. Easy peasy! The story is a coloring book so your little ones can color the pages and design their own storybook. Makes the toy making process even more fun and interactive! The coloring storybook, rag doll pattern and octopus pattern are also sold separately. 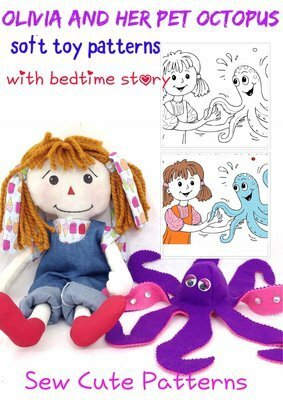 The rag doll and octopus patterns include a copy of the story (coloring book not included).